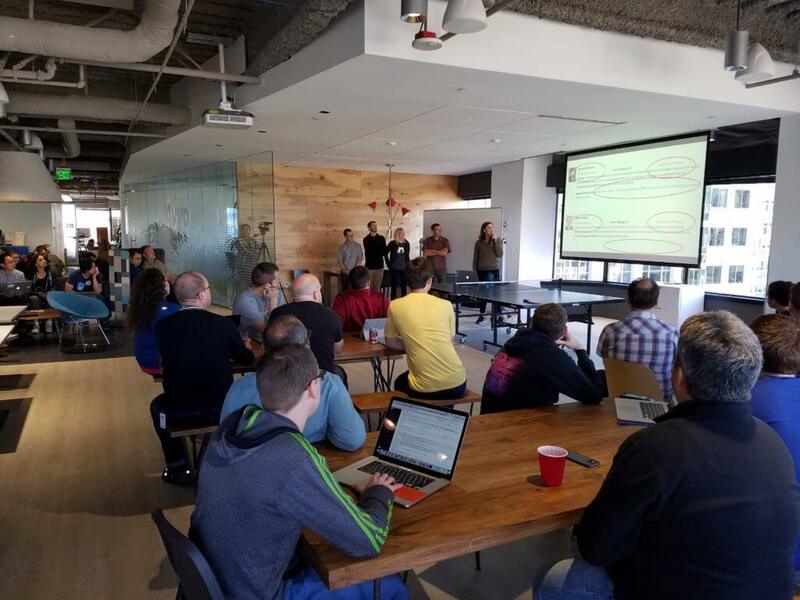 Every quarter, Avvo hosts a three-day hackathon. Usually these are focused on projects that benefit our own products or internal systems. But during our summer hackathon, we partnered with the Northwest Justice Project (NJP) to help them build a chatbot for their Facebook page. The NJP is a Washington based non-profit that provides legal aid to low-income individuals. Ranime Oueis, a second year law student from the University of New Mexico, is a fellow at ATJ Tech Fellows, and is doing her internship at the NJP. She originally shared the post that you see below here. Ranime is focused on intellectual property and cyber security law. We were excited to work with her and the rest of her team on this project. Imagine a world where tech companies and legal aids are able to collaborate on projects to create services that simplify the legal system. Attending Avvo’s hackathon exposed me to an approach that allows tech companies to encourage innovative ideas while also catering to the public interest. Over the course of three days, teams work on developing, coding, and testing projects for Avvo’s online platform, offered services, or end-user experience. Not only do hackathons provide Avvo with the chance to experiment and test new features prior to adopting them, but they also serve as an opportunity for employees to expand their knowledge and sharpen their acquired skills. The first step of the project is to identify what the team aims to accomplish in three days. Our team discussed a problem that the Northwest Justice Project is currently facing: users send messages to the organization’s Facebook page seeking legal information, but it’s difficult to respond in a timely manner. Our team chose to address this issue by creating a chatbot that responds to Facebook users with information related to the questions asked. Ideally, the chatbot would query search results from Washington Law Help’s website based on the user’s input and then relay the search results directly to the user. We met as a group on the first day of the hackathon to delegate responsibilities, create a tentative timeline, and identify some issues that would likely arise. The team agreed to collaborate primarily over Slack, a real time messaging and archiving platform for collaborative work. To visualize our project, we wrote a hypothetical on how the chatbot would function. First, a user messages the Northwest Justice Project Facebook page asking for help. 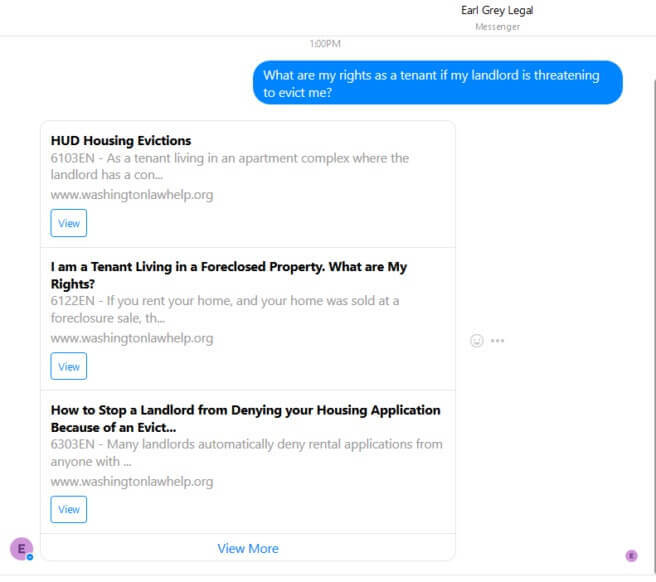 For example, a user can ask “My landlord is threatening to evict me for not paying rent in an unlivable apartment, what can I do?” The chatbot then responds with an introductory message and, based on the question asked, will provide the top three search results from Washington Law Help’s website along with a link to contact information. The team also proposed extra features if the project were completed early, such as providing a Spanish language option for the user. We quickly realized that adopting this feature was not feasible with the time we had. However, creating a “maybe” category of features was an effective time allocation method the allowed our team to meet realistic goals within given timeframes. On the third day of the hackathon, teams gave quick presentations and demos of their final products. Teams discussed potential obstacles, areas for improvement, and overall thoughts on their project. Our chatbot concept won an award for being most in-line with Avvo’s mission statement. Participating in the hackathon was an invaluable learning experience. It gave me an opportunity to network with individuals in the legal tech industry and introduced me to ways big tech companies can contribute to making legal services more accessible for low-income Americans. Are you interested in participating in a hackathon? AngelHack is a great website for finding information about hackathons all over the world. You can also get in touch with your local technology organizations or companies to find events that are open to the public. Facebook or Meetup event searches are also helpful as hackathon hosts often create events through social media.